Hobz or Traditional Maltese Bread | Simple. Tasty. Good. Have you heard of hobz before? Learn all about the classic hobz, the typical Maltese bread! If you have visited Malta before, then you must have come across this lovely bread! I love the smell of freshly baked bread in the morning! And in the afternoon! And even in the evening! Last year Belgian organic bakery chain Le Pain Quotidien settled in our town. This fortunately took away half of hubby’s workload. Excellent rustic breads. Back to Malta. 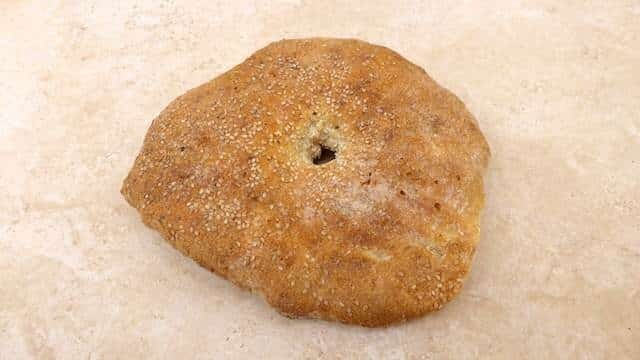 Maltese bread comes in 2 different ways: HOBZ MALTI (a light sourdough bread shaped into a ball) and FTIRA (a rougher shaped flatbread which has often a hole in the middle, looks like a huge rough donut). 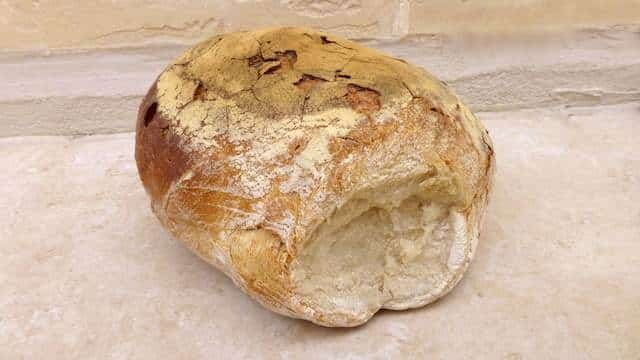 Maltese bakers traditionally bake the breads in a stone oven which results in a crunchy crust and a light and fluffy center. But what’s the difference between those 2 breads? You guessed it right: the ingredients! The Maltese hobz (hobz malti) contains water, flour and yeast. 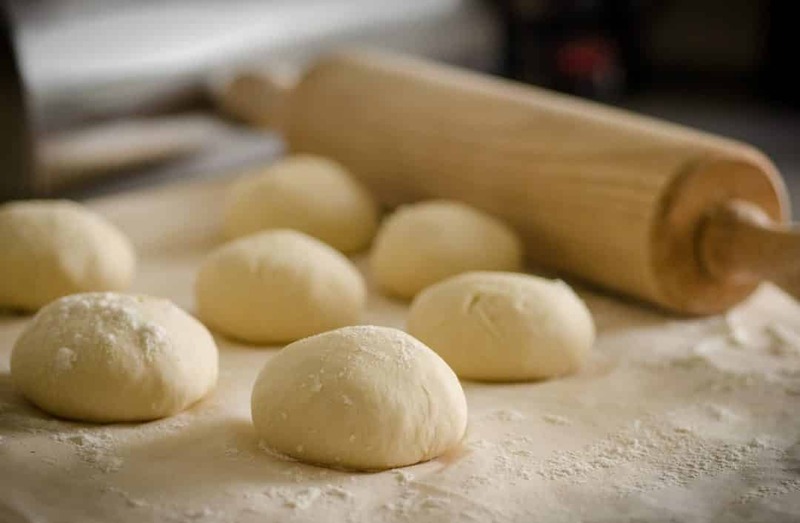 As soon as those 3 are mixed together, the sticky bread dough is allowed to raise at room temperature under a kitchen towel for a certain time and then kneaded again. Repeat that a couple of times until the dough is light and full of air bubbles. The ftira flatbread is mainly made of flour and water that is mixed little by little and left to rest for some time (a couple of days even) though I also find recipes using a little piece of yeasty sourdough from the hobs dough to help it raise. I have read quite a lot of different opinions on the internet though. Hey, I like the fact that people have their own specific home recipe for these things! Anyway, I asked our baker here in Marsaskala and he only uses the flour and water mixture, no yeast. Ftira comes in a few shapes. You will see that traditional ftira is mostly shaped into a huge donut like bread. Some bakers even sprinkle it with sesame seeds. However I have come across ftira breads in Malta that were pretty much square without a hole in it at all. Depends on who’s making them I guess! If you have ever visited Malta you might have come across loads of hobz biz-zjet. This is a popular Maltese sandwich: a hobz bread with canned tuna, salted capers, olives, fresh tomatoes (or spread with tomato paste), onion, lettuce, bigilla (a typical Maltese broad bean paste), Maltese boiled sausage, Maltese cheeses (gbejna), fresh herbs… and preferably drizzled with a little bit of olive oil. Hobz biz-zjet literally means bread and oil by the way. 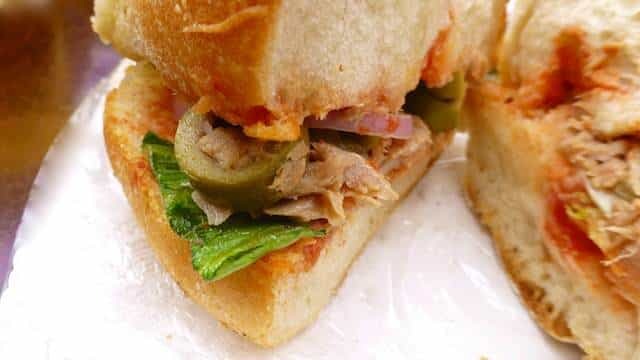 This hobz sandwich looks pretty much like a pan bagnat, a local sandwich (also containing mainly tuna, tomatoes, capers and lettuce) from Nice in France. Pan bagnat actually means ‘soaked bread’. Because the French also drizzle the bread with plenty of olive oil. A last remark about the ftira bread. In Gozo (a little island near Malta) there’s also a specialty called ftira but it’s not the same! I like the Gozitan ftira: a pizza topped with ingredients such as tomatoes, olives, onion, potatoes, local cheese… The dough is folded inwards right before baking which makes the crust very crunchy.